RIBA (Royal Institute of British Architects) Awards have been running continuously since 1966 and are judged and presented locally. No matter the shape, size, budget or location, RIBA Award winning-schemes set the standard for great architecture all across the country. Although more than 50 buildings in the UK won the RIBA Award, only 9 in the EU have won, including Centre Pompidou, calculated with GRAITEC Advance Design. The Centre Pompidou Metz is a museum of modern and contemporary arts designed by architects Shigeru Ban and Jean de Gastines and located in Metz, France. The Centre Pompidou-Metz is a branch of Pompidou arts center of Paris, and features temporary exhibitions from the large collection of the French National Museum of Modern Art, the largest European collection of 20th and 21st century arts. The museum is one of the largest temporary exhibition spaces in France with 5,000 m2 divided between 3 galleries, a circular shaped restaurant, a theatre, and an auditorium. The Centre Pompidou-Metz is a large hexagon structured round a central spire reaching 77 meters high, with three rectangular galleries weaving through the building at different levels. The great nave covers 1,200 m² and provides flexibility for the exhibition of large artworks, with the ceiling rising progressively from a height of 5.70 to 18 meters. The roof is a 90 meters wide hexagon with a surface area of 8,000 m². The roof structure is composed of sixteen kilometers of glued laminated timber, which intersect to form hexagonal wooden units resembling the cane-work pattern of a Chinese hat. The roof’s geometry is irregular, featuring curves and counter-curves over the entire building, and in particular the three exhibition galleries. The entire wooden structure is covered with a white fiber-glass membrane and a coating of Teflon, which has the distinction of being self-cleaning, protects from direct sunlight and also is transparent at night, thus offering viewers a spectacular and unique overview. 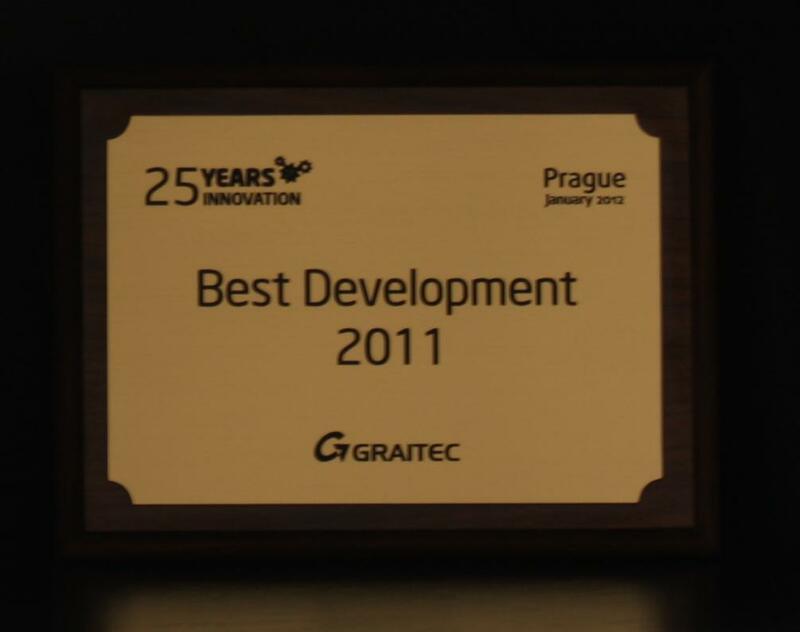 This year, GRAITEC presented the 2011 R&D AWARDS to 5 members of the R&D department in Romania. The awards were handed by Francis GUILLEMARD, CEO and founder of the GRAITEC Group, at the 2012 Kick Off, in Bucharest. The first 2011 Development Award was received by Bogdan ZAVU (Advance Concrete Team Leader) and Emil MOGA (Advance Concrete Senior Software Engineer), for the new DWG export procedure. The DWG export procedure is a key feature of ADVANCE Concrete, which was fully rewritten, resulting in a major speed improvement. The second 2011 DEVELOPMENT AWARD was received by Cosmin BARBU (Advance Design Project Manager) and Diana SERBAN (Advance Design Senior Software Engineer), for Crack Analysis, taking into account real reinforcement on beams and columns. Until now, Advance Design was dealing with the required reinforcement with regards to Concrete Design. Version 2012 of the software is making a big step forward, as Advance Design is now helping the user to determine the real reinforcement section and performing EC2 crack analysis. The engine of Arche Beam was extensively reused and adapted for this project. The TECHNICAL AWARD FOR BEST DEVELOPMENT was received by Mircea KLEPS (Advance Steel Senior Software Engineer), for the Graitec Modeler as part of the Advance Steel Standalone project. The component was first started by Mihai DOBRESCU and continued by Florin SECUIANU and Mircea KLEPS, Mircea being the one whose fingerprint was decisive for the current engine state-of-the-art status. In the next step, the component will be used for driving Advance Concrete. For more information on all the new features of the 2012 GRAITEC Advance suite, please visit the GRAITEC ADVANTAGE page at http://www.graitec.com/en/welcome.asp . 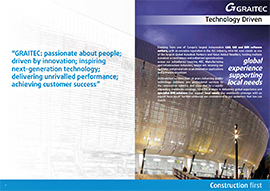 GRAITEC – finalist of Construction Computing Awards! Voting has now begun (voting closes on November 2nd), with the awards ceremony being held on November 17th at the Hotel Russell in London.